A common question we get is “How do you have enough time for school if you’re in band?” An honest answer is that the Band gives new college students invaluable skills and resources to succeed in class. 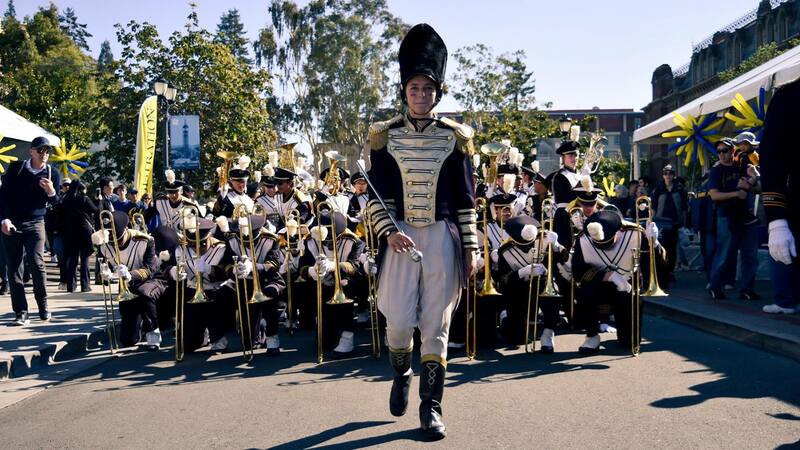 The Cal Band offers a variety of academic support opportunities. Academic advisors, study groups, review sessions, peer course evaluations, and a private band lounge are just a few of the resources we offer our members. Additionally, there is a great amount of peer support for academics among our members. Current bandsmen’s areas of study range from Chemical Engineering, to EECS, to Molecular and Cell Biology, to Linguistics, to Rhetoric. There’s always someone willing to guide and help younger members academically, whether it be helping with homework from a class they’ve taken already or advising on which courses and professors to look into. 55% of the Band is comprised of “hard science/engineering” majors. Because of both the size of Cal Band and our variety of interests, members often have classes together. Thus, even if the Band doesn’t offer a study group or review session for a particular class, students are easily able to find study partners before midterms, papers or finals. A large percentage of our members continue on to graduate study, including medical school, law school, and other graduate programs across the country. 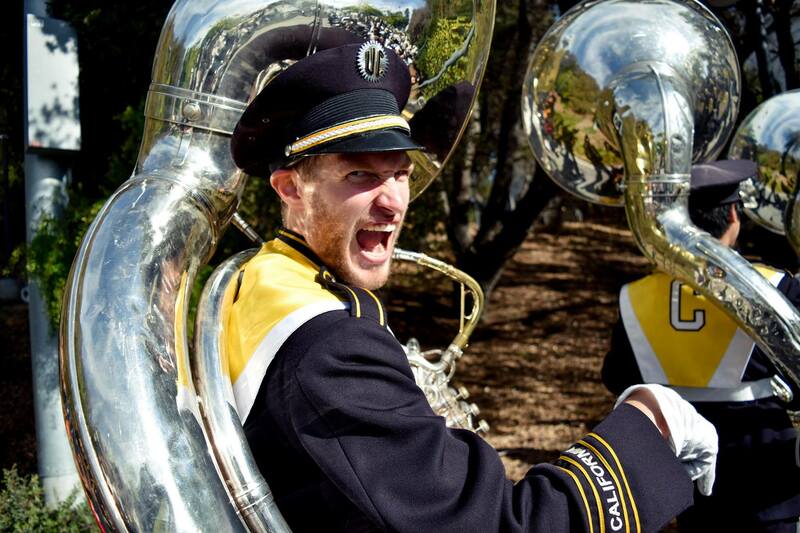 From performances to academics, the Cal Band offers a wide variety of opportunities to its members. Since the public at large is thrilled by the Cal Band’s field shows and Straw Hat Band performances, they often overlook how hard the Cal Band members work and how much we succeed academically as students of the University. In short, though maintaining the high performance quality of the Band is a time-consuming activity, our members’ academic standards are always aided and prioritized. We maintain that you must be a member of the university to be a member of the band, so academics always come first. For more information on how we help our members to succeed at Cal, email our executive secretary at execsec@calband.org. During the fall, the Band has a rehearsal regimen and a time commitment that, though heavy, can be completely manageable and rewarding for any college student. The fall season consists of music rehearsal on Monday and 1.5-hour field rehearsals every Tuesday through Thursday at Maxwell Field. On the weekends of home football games, there is an additional 1.5-hour rehearsal on Friday and, of course, game day on Saturday! In the spring, there are no rehearsals and bandsmen can opt to focus on academics or other interests and postpone further involvement until the next fall. 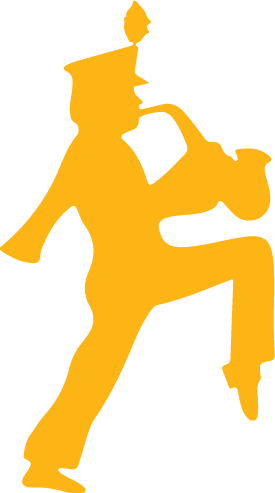 It is also very easy to remain active in the band by playing at Cal basketball, water polo, lacrosse, spirit events, hired events, and other spring performances. It is definitely possible to maintain a healthy mix of band, academics, and outside interests! It’s Saturday Morning, Golden Bears! It’s time for another day of Cal Football! But what does that mean for the primary spirit organization on campus? More than you might imagine. But with friends, family, and the support of thousands of Cal fans, the early morning wake-up is 100% worth it. 8:15 a.m. Gather Cal Band shirt and black socks from the dresser. 8:20 a.m. Leave the dorm! Ten-minute walk from the dorms gets shorter and shorter each time. 8:30 a.m. Arrive at the Band Rehearsal Hall. Change into uniform pants, put on black marching shoes, white spats, and uniform hat. 8:45 a.m. Arrive at rehearsal field, greeted by donuts, bagels, fruit, coffee, juice, and friends. 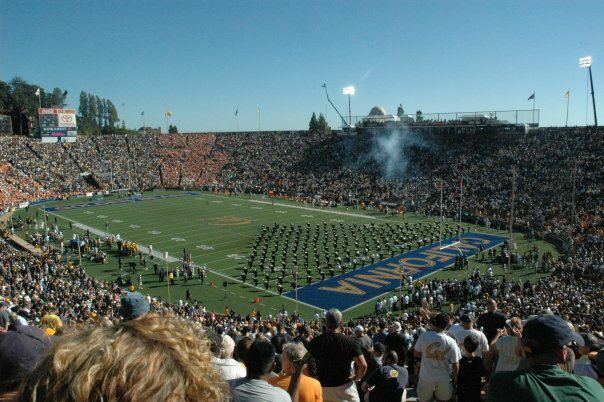 9:00-10:30 a.m. Rehearsal at California Memorial Stadium! Work out last-minute adjustments to pregame show and halftime show. 10:45 p.m. Gameday announcements. Traditional prediction of the margin of this week’s Golden Bear victory by alumnus and Cal Band Announcer Albert Locher, Assistant District Attorney of the City of Sacramento. 11:00 a.m. Lunch Time! Cal Band parents serve a bountiful barbecue of hamburgers, hot dogs, sodas, cookies, chips, salad, veggie burgers, candy, fruit, and other assorted snacks. 12:45 p.m. Change into the rest of the uniform. 12:55 p.m. Rub the Bear’s nose for good luck! 1:00 p.m. Instrument tune-up and warm up. 1:20 p.m. Traditional retelling of last night’s “dream” by the Drum Major (usually, they hype the band up about how we’re going to wow the audience over this week!). 1:30 p.m. Concert on the front steps of Sproul Hall to our gameday fans. 1:45-2:15 p.m. March up through central campus up to California Memorial Stadium. 3:00-6:00 p.m. The game! Crowd excited by the thundering entry of the Band through North Tunnel onto the field. A great halftime performance! Another week, another new performance, and another resounding applause by the student section. Postgame performance, played toward the alumni, signaling the end of another Cal Football game. A performance for Bowles Hall, the oldest dormitory at Cal. 6:45 p.m. Arrive back at Band Rehearsal Hall. End of the day announcements, one last performance of the school fight song for the audience still following behind us. 7:00 p.m. A choice of sleep, study, or whatever! For information about how to join the Cal Band or general questions you feel were unanswered, email the Recruiting Coordinators at calbandrec@gmail.com.